[Tier I] Silverton City Gym- "Generation Gap" Issue, please hold off on battling. Inidgo, you'll also have to wait until the generation gap is cleared. Re: [Tier I] Silverton City Gym- "Generation Gap" Issue, please hold off on battling. Do you use Pokemon Online? 'Cause it's kind of easier than training up a team on the game. And less waiting. And this is taking a while. The gym leader posted a notice in the first post/thread title saying that he wasn't ready to accept challenges. Furthermore, he hasn't even logged in since May. Speaking more generally, the league itself is unofficially dead and you're not likely to get any challenges from anyone. 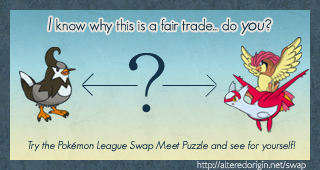 I just haven't had the time to decide what to do about the parts people would like to salvage and then discuss those moves/changes/etc with Butterfree, then shut the rest of it down.